Paul Mueller Co. does not muck around. The Springfield, Mo.-based process equipment manufacturer is an expert at building machines and facilities in all types of industries — from dairy to wine to pharmaceutical. 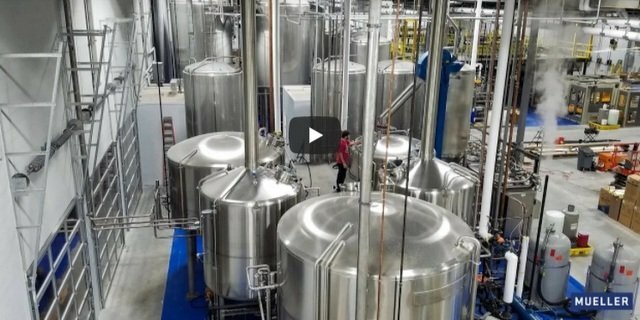 The company is also one of America’s top brewhouse designers. Just ask Green Flash Brewing Co. The famous California brand turned to Paul Mueller and friends to build its production brewery in San Diego in 2011. When Green Flash aimed to open its East Coast destination brewery and distribution center in Virginia Beach, Va., the brewery turned to Paul Mueller again. Green Flash wanted parity in product produced with its West Coast brewery, so it made sense to use duplicate equipment. It asked Mueller (said like this) to design the brewhouse and take on construction of the project. Paul Mueller fabricated the brewhouse, transported it, set it up, did a water brew, did a beer brew and worked hand in hand with Green Flash. Watch the fine folks at Mueller replicate the equipment, the process and the success above.